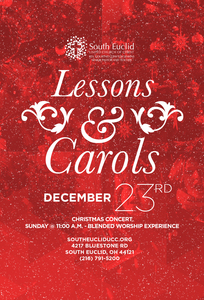 Join us for our Annual Lessons and Carols Worship Experience! Posted on December 23, 2018. All are invited to worship on December 23rd for a blended worship experience as we celebrate the birth of the Christ child. This worship experience will include special readings along with Christmas music lead by Dr. David Thomas and the music ministry of South Euclid United Church of Christ! This is an event you don't want to miss!! !